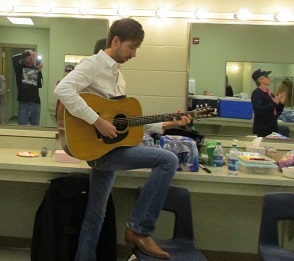 Mo Pitney, after spending the morning hunting pheasants with his brother, Blake, and their dogs, took the stage and sat on a stool with his acoustic guitar. I was disappointed at first that he didn’t have his band with him, as I would have liked to see the whole group perform. But I was quickly enthralled–and not ready to stop listening when he ended his show after ninety minutes. As a non-musical person, I don’t know the words to describe the quality of his voice. His rendition of “Borrowed Angel” is possibly the best example–although the YouTube version won’t be as good as hearing it live. He told us he’d first heard the song at age twelve, when his steel player dad took him to a steel guitar convention. An instrumental of “Borrowed Angel,” which Mo calls the perfect steel guitar song, was playing everywhere. Because Mo was humming the tune on the way home, his dad stopped at a store to buy the Mel Street CD so Mo could hear the actual song. Morgan Daniel Pitney is now 25, with several hit songs under his belt, and a great future ahead. He played a mixture of classics and his own songs, some already recorded and some from his upcoming CD. An excellent storyteller as well as an excellent singer, he talked as he tuned his guitar–sometimes going off on a tangent but always coming back to finish the original story. After singing “Farmer’s Daughter,” which he dedicated to the farmers and their daughters here in South Dakota, he called for requests for other Merle Haggard songs. He sang his favorite Merle song, “Mama’s Hungry Eyes.” He then called for requests for other singers. After “Who’s Gonna Fill Their Shoes,” he did a medley of Roger Miller songs, Willie Nelson’s “Angel Flying Too Close To the Ground,” and Tom T. Hall’s “I Love.” Someone called out, “Keith Whitley,” and he sang “Miami My Amy.” His voice shows off best when he sings ballads. He told us about the thrill of meeting Merle Haggard. After describing the meeting that took place at “two four two thousand thirteen four forty-five time of day,” he sang “I Met Merle Haggard Today.” He had been doing concrete work with his dad when a friend called to tell him to come down to the studio to meet Haggard. When he later told his songwriting partner about the experience, Don Sampson agreed to write a song as long as everything in it was true. While I was waiting for him to talk about his first hit, written with Bill Anderson, he told us about his second: “Boy & a Girl Thing.” Don Sampson was in an unhappy mood during a songwriting session with Mo, so when he said he wanted to write a song that began with “He’s gross, she’s got cooties,” Mo agreed to go along with it for the time being. The line stayed in the 2015 release. The BMI website shows Mo has written or co-written 302 published songs. As we listened to him tell his stories and sing his songs, it became clear that his songs are stories. “It’s Just a Dog” and “Cleanup on Aisle Five” are two great examples. The final song of the day was a heartfelt tribute to his Lord and Savior, Jesus Christ. There could be no encore after such a powerful song. Mo walked off the stage. I looked at my watch and was amazed to realize ninety minutes had gone by. Backstage, the Pitney brothers talked about family and pheasants and their hunting dogs. They are a joy to visit with. I look forward to seeing them at some future concert. Here’s my August 22 interview with Mo. 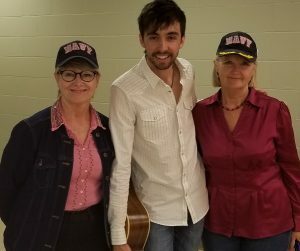 If you ever get the chance to attend a Mo Pitney performance, don’t miss it. When Garth Brooks debuts a new song on the 52nd Annual CMA Awards tonight, it will be a surprise to Trisha Yearwood, his bride of 13 years. He tells Sounds Like Nashville that the track isn’t directly about her, but its message about strong women reminds him of his wife. According to Taste of Country, the CMA organizers initially rejected Garth’s request to play his secret song, even though he’s the reigning Entertainer of the Year. But an agreement was reached. With Trisha center-stage, Garth will perform solo with guitar. “I think this is a song every relationship can understand,” he says, after admitting he could never have found the words to write such a song. Dave Rowland, lead singer of country group Dave & Sugar, died at his Nashville home on November 1, after suffering a stroke at age 74. Dave & Sugar, featuring Rowland backed by two female vocalists (beginning with Vicki Hackeman and Jackie Frantz), recorded hits such as “Queen of the Silver Dollar” and “The Door Is Always Open” between 1975 and 1981. He started a solo career in 1982. Nominees for the 2019 Songwriters Hall of Fame have been announced. Eligibility requires they must have written hit songs for at least 20 years. Six winners will be inducted in New York on June 13, 2019. The Associated Press reports the performing nominees are Mariah Carey, Chrissie Hynde, Vince Gill, Mike Love, Jimmy Cliff, Jeff Lynne, Cat Stevens, John Prine, Lloyd Price, Tommy James and the Eurythmics (Annie Lennox and Dave Stewart). Non-performing nominees are Jack Tempchin, Dean Dillon, Jerry Fuller, Tom T. Hall, Roger Nichols, and Dallas Austin. Tom T. Hall in the “non-performing” category? Do these people not know about his seven Billboard #1 hits and 54 charted singles? An all-star cast will pay tribute to Willie Nelson, 85, at Nashville’s Bridgestone Arena on January 12, 2019. Willie: Life & Songs of an American Outlaw will be a concert that features Willie, George Strait, Vince Gill, Alison Krauss, John Mellencamp, Kris Kristofferson, Lee Ann Womack, Lyle Lovett, Sheryl Crow, and others. Prior to next year’s Grammy Awards, the 6,400-member Producers & Engineers Wing of the Recording Academy will honor Willie Nelson at its annual event in February. According to The Tennessean, his career and achievements will be celebrated. Past honorees include Quincy Jones, T Bone Burnett, Alicia Keys, and Neil Young. Dolly Parton’s Heartstrings is a new eight-show series expected to debut on Netflix in 2019. Each episode will feature a Dolly Parton song, with an introduction by Dolly to talk about the song. Each show will have a different cast, explains Sounds Like Nashville. The first one is Jolene, which will tell the story of a friendship between two women who become entangled in a love triangle. Julianne Hough stars as Jolene, a flirty free-spirit who wants to move to the big city and be a singer/songwriter. Kimberly Williams-Paisley will portray Emily, the president of the Coventry’s Women’s League. Dolly will make a guest appearance as Babe, the owner of the Baby Blues honky tonk. Diane: The bio on Ricky’s website says, “In 1982, he became a member of the Grand Ole Opry, the youngest to ever be inducted at that time.” I don’t know the month, but with a birthdate of July 18, 1954, he was 28 if it happened after his birthday. Stonewall Jackson, born November 6, 1932, moved to Nashville in 1956. Soon after his arrival, his bio says, Wesley Rose set him up with an Opry audition and “he soon became the first entertainer to join the Grand Ole Opry without a recording contract.” The AllMusic bio continues, “By early 1957, Jackson had signed a recording contract with Columbia Records and cut his first record, ‘Don’t Be Angry.’ ” So he would have been just barely 24 when he joined the Opry. As for Asher Sizemore, his AllMusic bio says he and his five-year-old son were hired by the Grand Ole Opry in 1933, “where they remained a popular act for about 10 years.” It says, “Jimmy, at the age of five, allegedly had a repertoire of over 200 songs and understandably because of his extreme youth, his Opry and radio performances gained him a considerable following. He sang duets with his father but is remembered for his youthful renditions of numbers such as ‘Chewing Gum’ and ‘The Booger Bear’.” That sounds like he should be considered a full-fledged member, although you may be correct in your “technically” comment. I think Ricky needs to update his website. Although I like “There’s a Tear in My Beer” by Hank Sr. and Hank Jr., that’s about my limit on adding new voices to old recordings. What do you think about “duets” with a dead person, such as Deborah Allen with Jim Reeves? Or Jim Reeves and Patsy Cline having a posthumous hit with “I Fall to Pieces,” which they never recorded together? The question several weeks ago about updating Marty Robbins vocals with new music brought this to my mind. Isn’t it like doctoring a photo and passing it off as an original? Or do you like these newer versions? This entry was posted on Wednesday, November 14th, 2018 at 9:23 am	and is filed under Newsletter. You can follow any responses to this entry through the RSS 2.0 feed. Both comments and pings are currently closed.